The term stuck in a rut is used to describe a situation where people feel frustrated and powerless to change, when it comes to fitness, it often means you feel so flat about your level of fitness and physique that you know you need to do something about it - yet, you feel so lethargic, upset with yourself, and disempowered that you don’t have the inner fuel required to get you back on your feet. When you’re stuck in a fitness rut it can feel quite depressing, and it can seep through to other areas in your life. It can have a profound effect on the way you view yourself, as a person, and it can certainly knock your confidence. The challenge when it comes to fitness, is that often you are having to fight yourself, in the sense that you are having to fight your own procrastination and low levels of motivation in terms of getting back in shape. It can feel like pushing a boulder, the idea being that it takes an enormous amount of energy to move that boulder from a standing start, yet when it starts to have some momentum behind it, everything becomes much easier… and that’s the secret ingredient to getting out of a fitness rut - momentum. See, when first go back to the gym, put on your running shoes, or do whatever else you are going to do to break yourself out of this place - it’s going to hurt. Literally, your muscles will be much more sore the first few times you exercise, than they will a week later, as they are simply out of condition - meaning they aren’t used to this anymore, and they will respond with a few aches and pains. Yet, have you ever noticed how two weeks down the line, you don’t have that pain anymore after working out? It’s because your body is adapting and being conditioned to the endurance you are putting it through. Similarly, on a mental level, momentum builds like a snowball gathering speed down a slope - because as you start to see visible signs of progress, you start feeling better about yourself, which makes you want to do more, which creates more aesthetic changes, which motivates you further… and you find yourself in an upward spiral of positive change. See, the mental power within fitness is that of making progress. You can be massively overweight and lose a stone in weight, and feel fantastic - yet, you are still massively overweight. There is power in progress, and that’s the best antidote to getting out of a fitness rut… but it takes some time to make progress, and the hardest part, is starting out - just like the boulder metaphor above or the fact a jet consumes the majority of its fuel on take off. Therefore, in this article, we’re going to look at some practical ways to start moving that boulder in the right direction and take the first steps to getting out of a fitness rut. As, so often it’s that first step that is the hardest - but once you have taken that first step and you have some momentum behind you, you start to gain confidence and become unstoppable! 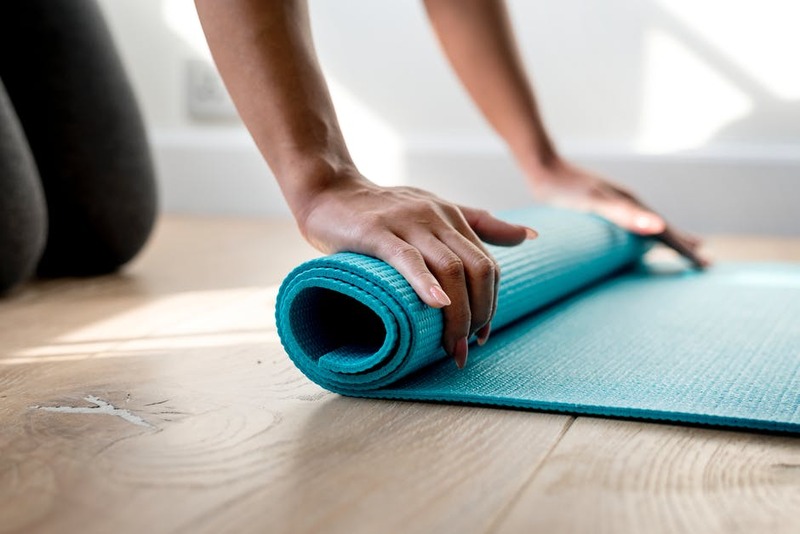 There are many things you can do at home, if you are feeling a little gym shy, as today there are a plethora of classes on YouTube and other platforms that allow you to undertake anything from yoga and pilates classes to high intensity interval training. The world leader in fitness classes, Les Mills, has now made its leading classes such as Body Pump and Body Combat available online via a Netflix like platform. The great thing about working out at home, is that it’s massively convenient and can work around your schedule - rather than you having to work around a gym’s timetable. Fitness, at times, can feel arduous so looking for fun activities to get you back in the swing of things is a good idea. For instance, you could look into salsa classes if you have an interest in dancing or boxing classes if you like the idea of something more explosive - the trick is to do something that you find fun and engaging. This way, you’re more likely to stick with it and keep on going back. If you’ve been out of regular training for a while, it’s really important to start off by taking it easy. There’s nothing more tempting than going back to an exercise class you used to go to and presume your body will perform at the same level it did when you were doing the class a couple of times a week. This can not only be emotionally frustrating - but physically dangerous too… as if you adopt the approach of “go hard or go home” in your first few sessions you’re likely to injure yourself. Remember the importance of warming up and cooling down, as this is particularly important when getting back into training and it can be useful to visit a sauna or at least have a hot bath after working out so the muscle fibres can relax. One of the best forms of exercise for someone starting to get back into fitness is swimming, as swimming is a very supportive form of exercise that doesn’t put too much pressure on the joints, such as your knees, unlike the majority of other activities such as running and aerobics. Whilst you might feel the only way to lose weight is to engage in activities like plyometric lunges and burpees - you need to ease your body back into such activities, and recondition some of the smaller supportive muscles to ensure you don’t hurt yourself. Swimming, and particularly walking through the water, in terms of fast wading, can be incredibly helpful to build back the strength of key supportive muscle groups. In summary, when you’re looking to get out of a fitness rut, you need to be gentle with yourself, start off slow, recondition your body and then ride the wave of progress and momentum - to take you to new heights.